With BlackBerry and TCL expected to show off the next generation of BlackBerry devices at CES in Las Vegas next month, one of the handsets is expected to be the last model designed in-house by BlackBerry. 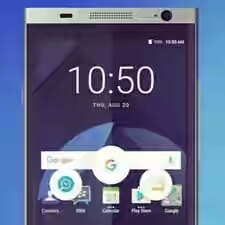 As expected, this device is supposedly going to have a QWERTY keyboard. 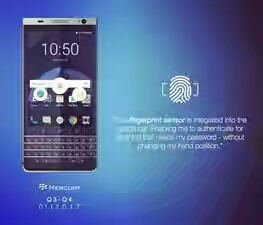 Previously leaked images of the phone, which was given a code name of "BlackBerry Mercury," revealed a handset that looked like a trimmer version of the BlackBerry Passport with a physical QWERTY on board. This morning, some new renders of the Mercury surfaced, revealing a dual curved-edge screen (although the curves seem mild compared to others sporting a similar design), and there is the physical QWERTY. Unlike the Passport, which uses a combination of physical keys and on screen characters, the Mercury's QWERTY keyboard includes punctuation and numbers. The BlackBerry Mercury will reportedly be powered by the Snapdragon 821 chipset, which includes a quad-core CPU and the Adreno 530 GPU. A large battery with enough juice to run the phone two days on a single charge is expected to be inside. The screen-size, shortened by the physical QWERTY, is said to measure 4.5-inches. A fingerprint scanner will be embedded in the space bar. This will be the first 'Berry to include the Biometric reader. All subsequent BlackBerry handsets after the Mercury will be designed, manufactured, marketed, sold and supported by TCL. The most recent pair of BlackBerry handsets, the DTEK50 and DTEK60, are re-branded TCL models. The former is a Alcatel Idol 4 that was revamped for BlackBerry, while the latter is a revised TCL 950. Alcatel is a partnership between Alcatel-Lucent and TCL. BlackBerry found over the last few years that it was not able to compete with Apple, Samsung and other handset manufacturers. As a result, the company is focusing on software and services.